It seems that I am constantly losing the eating healthy battle. I know it’s a lifestyle and on the whole, I make sure we do eat healthy, but sometimes its so hard to be in the mood to cook after you have spent all day running around. The desire to cook balanced meals goes right out the window. Eating healthy is not difficult if there is say, just you. However, in my family I have 3 teens/preteens (girls at that, one vegetarian,) and a 7 year old boy and my husband who might as well be a child also. When they were younger, I could enforce healthy eating and I did. I still keep no soda in the house or potato chips/crisps and pretty much no junk food. Unfortunately for me, the supermarket is walking distance form my house, so when they have a bit of money, off they go to buy all the things I don’t keep in the house! It’s a battle that I am sorely losing. This is all the more reason I make sure that I cook all food from scratch and make the meal as well rounded as possible. Believe me it’s not easy for me because as I get older, I am more picky than all of them. There are so many things lately, that I have developed an aversion to. I don’t know if my medication affects me or it’s just that my taste buds and sensibilities are just shot! So having fallen off the band wagon for the umpteenth time, I am trying to focus on what’s going in my body. Being a Brit, I can live on cheese and toast, unfortunately, that’s not a good thing for me. I put on weight so fast if I indulge solely on bread and cheese. So, I am trying to make every mouthful count and eat more greens, whole grains and so on. You may or may not know my issue with greens, one being I don’t eat too many of them. To find out more read here. The other day I bought a bunch of rainbow chard to make my Indian style spinach dish but with chard. This seems my favourite way of downing greens easily. Also, everyone at home will eat it too. 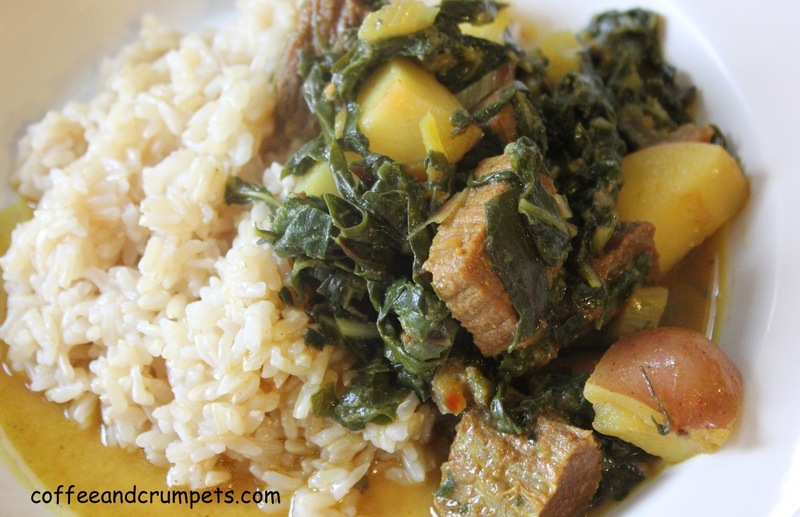 It is pretty tasty and you can make it with chicken, beef or lamb. If you know my history with lamb, you’ll know that I cook mainly beef! The beef is braised first or in my case, pressure cooked, and then the chard is added and wilted briefly. It takes way too long for beef to tenderise where I live so, I use my pressure cooker to hurry it along. You may cook it however you like, braise it, slow cooker it or pressure cooker it. Brown the onions in a pressure cooker pot or a Dutch oven if you are going to slow braise the meat. Once the onions are golden, add the beef and toss around to brown a bit. Stir around a bit till meat is browned, add the water and pressurise according to your cooker. 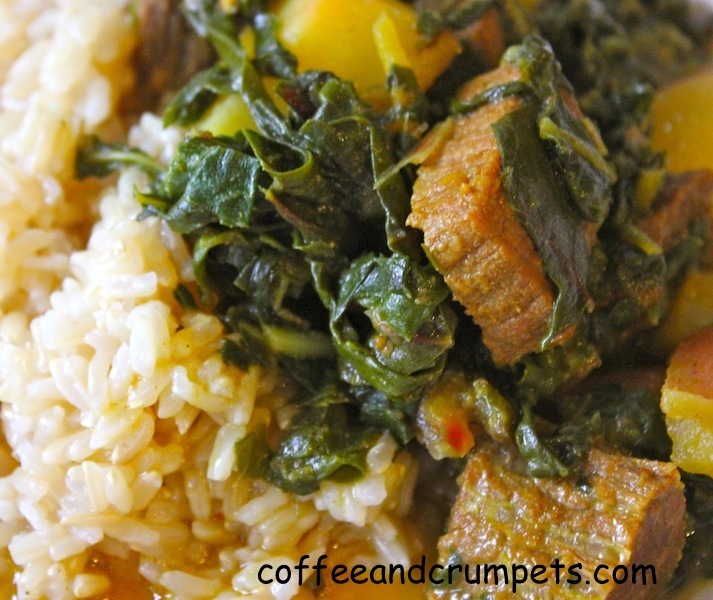 If you are doing it without the pressure cooker, just cover and cook till meat is tender, 60 to 90 minutes. Meanwhile, wash and cut the the rainbow chard in shreds. Once the meat is tender, add the potatoes and cook till tender but still firm. Add the chard shreds and let wilt in the pan. Stir around and let the liquid evaporate. Add the cumin and coriander powders and check seasoning. I like a little bit of liquid in the dish so there’s something to spoon over the rice. 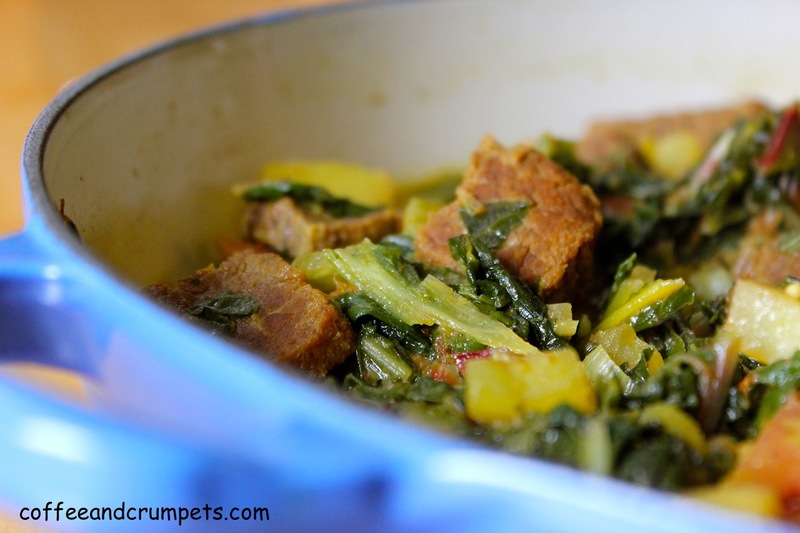 The chard does not need much cooking, just the potatoes have to be tender and most of the liquid evaporated. I like to add some dried fenugreek leaves to my chard, Adds a very distinct flavour and aroma. It can be too strong if you are not used to it, but it’s a great flavour and has slight bitter undertones that add a pleasant taste to the chard. I always add fenugreek to my spinach also. The dish is done once the liquid has evaporated to your preference. Serve with some steamed brown rice. So, your turn, what do you have difficulty eating? Is there stuff that you absolutely don’t like or do you have a hard time eating healthy? I will leave you with a couple of pictures of my crab apple tree, it is blanketed with young, green apples right now. I can already see the mess in my back garden when they all fall. I have many Indian friends and they cook really delicious food. Thanks for visiting. Your dish sounds fabulous! Thank you Mamat. I found your site amazing and a great resource for Moroccan food that I love. Thank you for stopping by. my husband is indian and we love to make spicy indian dishes. i have to get rainbow chard this weekend so i can make this delightful dish! Thank you for visiting! I have a few Indian recipes on here and I hope you will try some of them out am dlet me know what you think. Sounds delicious! And it’s another way for me to use chard. If you’ve ever grown it, you know you can end up with a LOT of it! I love your crab apple photos. Just gorgeous. I have heard that! I haven’t grown chard personally, I don’t know what I would do with all of it! Thank you, the apples are coming along nicely. A splendid dish and great combination! Scrumptious. Thank you Rosa, it’s one way to eat my greens which I seem to have a lot of difficulty with constantly! Oh, Yum! I have a sweet tooth and can finish a tub of nutella in one day, so that is my downfall. Fortunately, I love veggies, and as long as I have a variety of them in the fridge, I know we will be able to cook. I could eat roasted asparagus every meal! Anyway, I loved your suggestions for my spinach the other day, and it was really delicious. Creaming greens is definitely a good way to make veggies more palatable. I’ve never used rainbow chard before but oh my this is so beautiful! I chukled when you mentioned you considered your husband as a kid. LOL. I feel the same way sometimes! This looks VERY delicious! I need to look for rainbow chard first. Thanks for sharing the recipe! I don’t use it as often as I should but I am trying! Thanks for visiting Nami and for your wonderful comment. And do husbands really ever grow up? 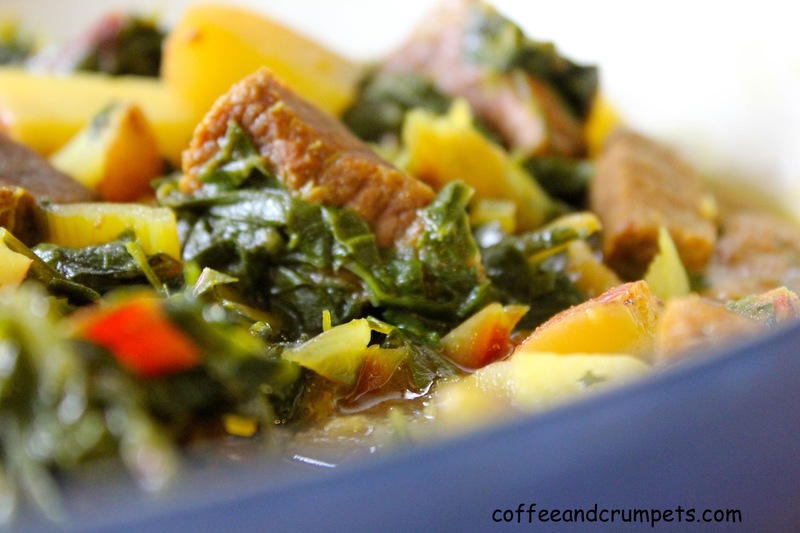 I love how you have made this updated dish with chard. I’ve never cooked it in any similar way and will definitely try this, but maybe in cooler weather than we are experiencing now. I am sure it is very warm where you are! We have our usual unpredictable Colorado weather, sun and heat one day, snowstorm the next! I think I made this on one of the cooler nights. No I haven’t but ever since we moved into this house and I saw the tree, it’s been on my list. I thought about making a crab apple-jalapeno jelly. I’ll post it in fall sometime! That’s if the robins leave us any apples. It’s one way to eat my greens so I make it and it is good. I have lots of rainbow chard growing in my garden. I sauteed some the other night for the first time this Spring and it was absolutely delicious! I did notice a difference in that it was still young and tender. (why are so many things that way, including humans? ha, ha) We will need to eat chard several times a week so that it doesn’t grow too tall and become tough. 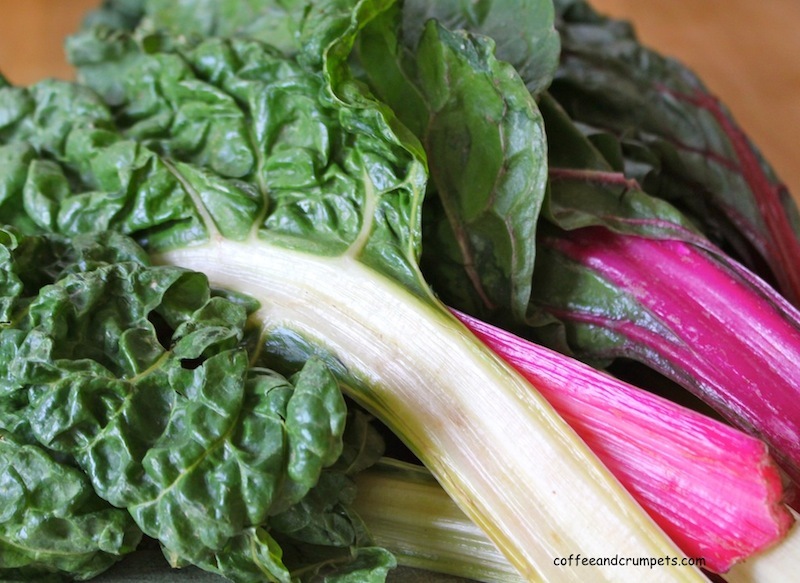 I have to confess that chard has an amazing effect on one’s digestion! It has tons of fiber, get it? I will try your delicious sounding recipe, but with elk instead of beef. Sounds good with elk! Step it up a notch. I want to try elk but am afraid it will go the way of the lamb!You got any good chard recipes? The markets are filled with chard at the moment. I also often indulge in what I shouldn’t, especially when I’m tired and hungry (luckily I hate sodas and never buy pre-cooked food maybe because no one in my family ever did…). This braised beef sounds fabulous. Me too! When I am tired or ravenously hungry and have nothing prepared or leftover, my eating suffers. I just grab whatever, usually a lot of bread, and then its down hill from there. Unfortunately for me, I do like soda and that’s why I don’t keep it in the house…I will drink it. I love pressure cooker recipes! I love using mine as it is such a time saver! We really need one here. Things take much longer to cook and it just saves so much time. I’ve never heard of (or seen) rainbow chard before – it looks so beautiful… does it taste any different from regular chard? It looks like a beautiful dish – something new for me to try! It’s so hard to keep on track especially if you have children. My weakness is bread and pastries. I think rainbow chard tastes a little milder than regular but maybe that’s just me. It is very beautiful and especially now at the farmers markets it overflows from their baskets. Gorgeous! Thanks for stopping by Charles.